Expectations are not a problem for Mason Manville. He has been carrying them around since he was a tike. It’s part of the deal. You don’t amass an astounding run of success going back to your pre-teen years without others anticipating one achievement after another. Those off the mat, they think it will last forever, this mechanized dominance. Set it and forget it. Only, there are no shadows to duck into, no getting cozy in the crawl spaces which surround a sport that necessitates unrelenting desire and unyielding dedication merely to participate, let alone succeed. These athletes are called upon to prove it time and time again in front of everyone and everything. So from the outside looking in, all you really hope for is that they have love for what they’re doing. That, too, is not a problem for Manville. He does love wrestling. You could say it’s easy for him to do so, given the fact he’s had more medals draped around his neck than he can probably remember. But he’d be doing this anyway. That much is clear. 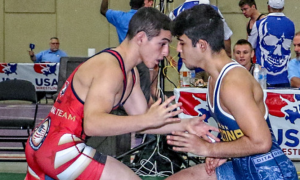 Manville doesn’t see Greco-Roman wrestling as a stand-alone art form, likely to the chagrin of the old guard. No, he sees the entire practice of wrestling as an art and as such, he has managed to accomplish what true artists are known for — he’s come up with his own style. Call it “analytical abstract fusion”, the precise breaking down of techniques and the subsequent process of melding them together so the end result is both efficient and hard to define. You don’t develop your own style by accident. Love has to play a role. But even with this love, as a Senior Greco-Roman wrestler, Manville didn’t just burst onto the scene like he had as an age-group competitor and just start tearing down the paradigm. 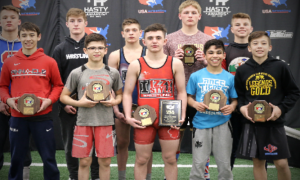 A Cadet World Champion in freestyle, Manville showed equal promise in Greco with a substantial amount of good tidings there, as well. He has ability all over the place, but it took a little while for the now-20-year-old to put it all together. During that interim, some wondered why he was prolonging what is sure to be a banner collegiate folkstyle career just so he could take some lumps in a sport that is all too often misunderstood and misrepresented in this country. Well, Manville knew something they didn’t. 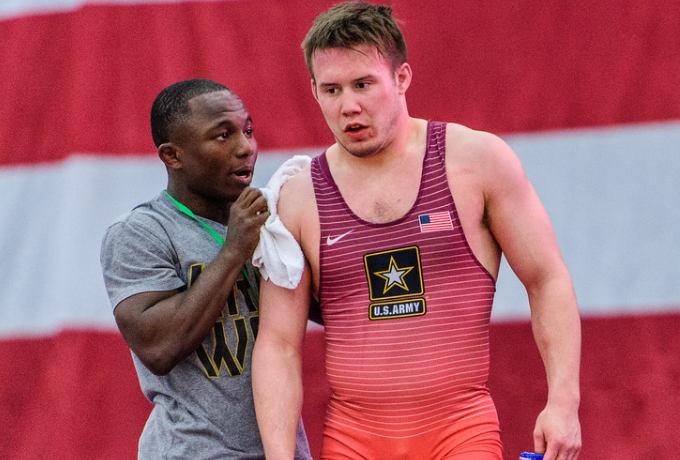 Two Saturdays ago, Manville ran the table and captured the US Senior World Team spot at 75 kilograms, defeating fellow young phenom Kamal Bey in two straight matches to wrap it up. There weren’t many who saw this tournament victory coming. Reasonable, perhaps. Though for Manville, this wasn’t a belief thing, more of an execution thing. You give an athlete like him the space to grow into himself and enough time to figure out how to beat you, this is the kind of thing that happens. A crowning moment, indeed. But really, Manville is just getting started and he is about to get all geared up to take on the world. Again. It’s a ride he is looking forward to. 5PM: If you’ve ever read anything we’ve done regarding you, previews or otherwise, your talent and ability has never been in question. But at the same time, leading into the Trials I was certainly one of your doubters. And then talking to Coach Lindland, he said that your performance wasn’t a surprise, that you’ve been a World Champ before. 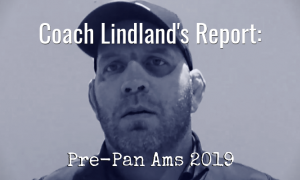 So who’s right — Coach Lindland, or the other group who didn’t expect this kind of result? Mason Manville: I understand why people would be, let’s not call it doubtful, but skeptical of my ability at the Trials. The highest I had ever taken at either the Open or the Trials was fifth and I think people understood I was talented, but was I really ready to make the National Team or World Team? I could understand why people wouldn’t place their chips in Vegas on me. I could understand that. It doesn’t offend me if people were skeptical. But I knew my worth, I knew the people who had met me and had actually seen me train knew my worth, so it didn’t bother me if others didn’t see me as a title contender. So, no problem. 5PM: Walk me through it a little bit. The Porter match was when I was like, “Okay, we may have something here.” Then the Cowan tech was, “This is serious now”, and not because you made the finals, but how that match went. Obviously, there were the bouts with Bey and everything else. If there was a point, when was the point on that Saturday where you said, “I’m in this now, I’ve got this”? MM: I took it one match at a time. If you watched the videos, in the Porter match I kind of clapped my hands. 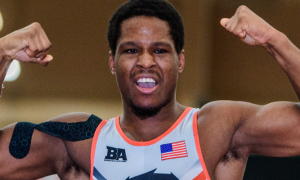 I usually only celebrate during the finals after I actually win, but I was happy about beating Porter because for me, I never lost to him and I always took it as a bit of a slap in the face when USA Wrestling ranked him above me when I had five wins over him, all by tech. I was very disgruntled about it and I took that match with a grain of salt. I was like, Okay, now I have to face Dillon (Cowan), who tech’ed me at the Olympic Trials like, easily. So going into my match with Dillon, all I knew was that if I didn’t give him my arm, he doesn’t have any other techniques that can harm me. His best technique is his arm throw and if I kept my right hand to my body I can outgas him. He doesn’t have the gas tank I have, so I was not worried. But I think the real clicking point where I said, Okay, I’m going to make the World Team this year was at the end of the first period during my first Kamal match, the first match of the finals. I just felt him slowly breaking. He was dead-tired and I felt fine. I just felt that he was not going to be able to recover. If he did beat me that first match, he wasn’t going to be able to recover for the next two. So halfway through my first match with Kamal I felt like I had sealed the deal. 5PM: It’s the way you did it. That’s one thing that does stick out about you, you never stop moving, you just never stop moving, and you didn’t in those matches. You were creating angles and getting in and around him a lot. How much of your past experience working out with him played a role in your strategy? MM: From working out with him, I kind of had a grasp on what his gameplan was. Obviously, after wrestling with a dude for so long you can tell their twitches. But I actually never beat Kamal in practice. Ever. He would always beat me. I think really, it was just the path month I got to train up at Penn State in the Nittany Lion club room. The hand-fighting with (Frank) Molinaro, Zain Retherford, and Vincenzo Joseph, they’re heavy-handed and that really prepared me for the pummel. I really think that high-level folkstyle hand-fighting is very important, at least the mentality aspect and the cardiovascular aspect for high-level pummeling for Greco. I feel like it’s good cross-training, if you want to call it that. The constant movement and the constant pressure wasn’t really about me knowing Kamal’s technique. It was just me already implementing a style that I love, which is me going out there and fighting as hard as possible, and actually having the gas tank and the slight technique variance I picked up in the months I was with the Nittany Lion guys just getting pounded on and my head snapped by really skilled folkstylers and freestylers helping me with my Greco. 5PM: That’s where we need to go next. In the past, plenty of this country’s Greco wrestlers were collegiate folkstylers and still managed to compete well internationally, for sure. That line of thinking has gone away, there is now a focus on getting athletes into Greco younger. You make it no secret that you see yourself as a complete wrestler, regardless of style, and have been successful in all three styles. What is it in your estimation that people are misunderstanding about Greco, folkstyle, and this topic? For me, I take that mentality into wrestling. I chop it down to just this corner of the combat sports world and all three styles are intertwined. You can use techniques, to varying degrees — you do have to curtail them a little bit to fit the rules — but pretty much every technique can be used in all of the styles if you are clever enough to work them in. Sometimes, my trap-arm gut is literally a cross-wrist roll-through. I remember in the finals of the Greco Pan Ams my second year, I hit a cross-wrist roll-through to tech him out (laughs). I brought my folkstyle training into the finals of the Greco Pan Ams and tech’ed him out using a cross-wrist roll-through because it was there. I really think, for me at least, it doesn’t matter. As long as I focus on skills that are universal, that’s the most important part. As long as I hit on all of the fundamental skills that I need to, the style doesn’t matter. 5PM: To be fair though, you’re very skilled and talented. So the follow-up is, would any wrestler be able to apply this approach and be successful? I mean, can this be useful for just anybody? Mason Manville: Yeah, I feel like anyone can use this mentality. This is how my dad teaches all of his kids. I don’t think he’s ever said it like that. I’m a big philosophy guy, so I try to dabble and put it into words what the mentality of my wrestling is. But my dad has taught all of my brothers and all of the kids at his club the same thing. “Wrestling is wrestling” is preached, it is one of the core buzz phrases my dad has thrown out there and I think anyone who truly sticks to learning everything they can from all three styles will become a better wrestler in either all of the styles or one of the styles. You might not be the best at all of them, but if you can learn the most you can from all of them, you will be very good at at least one of them. That’s what I believe. 5PM: Where do you fall on the way wrestling is constructed in this country? Folkstyle goes most of the year and then in the spring it’s the international styles for the age groups. Do you think all three styles should be accessible and represented throughout the year? MM: That’s a really hard one. As a guy who has went through a lot of good high school folkstyle wrestling rooms, I have a deep love for folkstyle, even though I know it has its time, at least in the current situation because of college. So I understand why some might be misinterpreting that folkstyle is the most important early on. But do I kind of wish that we got rid of folkstyle and had freestyle and Greco in our high schools and colleges? Yes. No, I wish we could do that but it’s not the case right now. So I am going to do my best with the current situation and system that I have. That’s my kind of thing, so I don’t want to sound like a hypocrite saying, Oh yeah, I wish everything was freestyle and Greco, even though I’m benefitting from the folkstyle-oriented American system. 5PM: My contention is that we don’t need to get rid of folkstyle, merely that in the United States of America, it’s crazy to me that we can’t offer all three styles all year long. Kids can choose different gymnastics, different styles of dance and martial arts. Why not wrestling? Kids don’t have the choice. MM: I agree. If we could somehow have it so that all three styles are represented at every level I would be gung-ho about that. I would be gung-ho if schools could have all three styles, it would be the greatest thing and probably the happiest day of my life. For both boys and girls. I’m a big proponent of growing girls wrestling. I want girls wrestling in high schools. Actually, my alma mater, Wyoming Seminary, just got Erin Tomeo (Vandiver), former women’s head developmental coach, she is now coaching our brand new girls program and we’re getting a lot of good girls here. So I’ve got to give a quick shout out to Sem and rep them for growing the sport in the right way. But yeah, I think D1 girls wrestling should be a thing. I think D1 folkstyle and Greco should be a thing, so NCAA and USA Wrestling, make that happen, please. 5PM: If anything, it would just stop the debate. 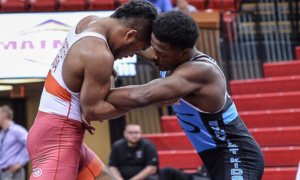 MM: I think if anything, it would at least mitigate the tribalism that we face in our wrestling community like, The Greco guys don’t like the folkstyle guys, and the folkstyle guys think everyone is stupid for going freestyle or not going to college. It’s weird stuff. They have the weirdest debates about stupid things. 5PM: We just recorded a podcast episode with Joe Betterman and he brought up the idea that Greco guys should be training with freestyle guys and vice versa because there are ways to get the most out of these styles. Maybe there are ways we don’t apply these principles to our benefit. Is that true, do we not do that enough? MM: I don’t think by and large, but pockets of the nation do. I’ve been blessed that my dad believed heavily that all three styles needed to be taught. My dad teaches freestyle and Greco techniques during folkstyle season. Or he’ll bring up, You see this move we’re learning right now? 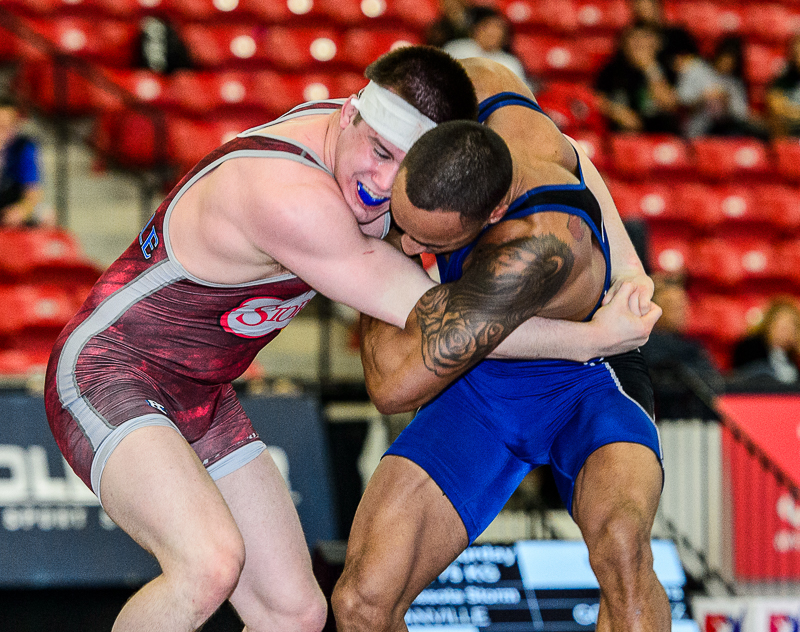 You could get even more points from it in freestyle or Greco, so keep that in mind. He brings stuff like that up. He’s a great coach and he is really helping out Northern Virginia. I was also really blessed to come to Sem where they were very supportive of my World aspirations in any style. They helped me last year prepare for the Olympic Trials. Those two — my dad and his club, and Wyoming Seminary, are for me the all-in-one, being clever at getting people to practice the skills in all three styles. They do a very good job at that. 5PM: You’ve completed the first step, making the World Team. Being a student of the sport, you know who the major competition in the world is at 75 kilograms. How do you see your style, your approach, matching up against these types of opponents in Paris? Mason Manville: You know, I think there are still holes I need to fill. I still need to upgrade my pummeling skills. Right now, it’s really two-on-one heavy, which is good, I think I’ll still be using my two-on-one primarily. But if I do get in an over-under situation I need to be able to pummel into a more comfortable position. I think pummeling out of ties and into my own tie is going to be a big thing. I think with high-level changes re-attacks are going to be a big thing, as well. And then obviously, par terre defense. As Americans, we all need to get better at par terre defense at the very least. Those are probably the three areas I would focus on the most. And the fourth one would be my par terre offense. I feel like my pace, once I get into World-gear shape, I think my pace will be there. My mentality is already there, I just need my body to be able to keep up with my mind. I just need to be able to out-pummel and re-attack these guys and I think I will be very successful. I have no worries. I am going to go out there with the same mentality I had at Trials with a big ole smile on my face and just go in there to fight. Not be dumb and fight. But with a steady hand and a calm mind. 5PM: You’re also going to be starting school, correct? MM: I was originally going to be starting summer school but with how crazy my summer just got, I doubt it will work as much as I was hoping. It’s not a deadlock yet whether or not I’m going to school, but it definitely adds a caveat to that decision. But at the most conservative, I will be starting school at Penn State in the fall after Worlds. 5PM: Looking at you, knowing your career and your history it has been a lot already, but at the same time you’re 19 about to turn 20 (ed. Manville’s 20th birthday was the next day following this interview), and this is a lot for any reasonable person to go through, making the team, the Worlds, and then starting school. It seems like a lot to go through. You seem so level-headed. Does maturity come from your previous success, traveling, and everything else? This doesn’t seem like it’s too big for you. MM: It’s obviously a huge honor and I don’t want to downplay it like, Oh yeah, I should be here. I don’t believe in that kind of stuff, like, Yeah, I’m that bad of a dude. Yes, I think I’m the best in the world but I’m not going to downplay this kind of thing. It’s a big deal. It’s not only a big honor, but it’s a big responsibility on my part. I took the reigns for the USA at this weight for this year and it’s my duty to take the throne of the world for the US and bring back some hardware. But I’ve been in situations like this. I’ve been in big matches. I’ve felt what it feels like to earn a World title. It’s not at the same level, it’s not at the same age-group, but I feel like that feeling would translate into the kind of pressure and dedication it takes. I don’t want to trivialize it. This is just another day on the job, this is just my life. This is what I need to do and I take this seriously. But I am not going to let this eat my soul. That’s the kind of mentality that I have and I feel like this is the mentality a lot of people need to start adopting. It’s a big deal, but you can’t let it eat you alive or you’re not going to actually do your job correctly. 5PM: You said a lot of people need to start adopting that attitude so my next natural question is, do you think there are a lot of wrestlers who have a tendency to build things up and over-pressure themselves and that’s what causes them to not achieve the results they’re looking for? Mason Manville: I don’t know if it’s over-pressuring themselves or getting excessively hype. There is a time and place to be pumped up, but you have to take that in short doses and that’s just to help you get into flow-state. If you’re pumped up all of the time, you’re going to knock yourself out of the correct attitude and you’re going to be too hot-headed. So I worry that some people might get too excited too early. That’s my only thing. People need to take a deep breath and analyze it very rationally. Every second of every day needs to be thought out for a purpose. It shouldn’t be, I feel really good, I feel really good. It needs to be, I feel really good, I’m going to analyze why I feel so good today in my training and I’m going to try to replicate that. I’m not going to just hype myself up, I’m going to do the things again that helped me feel positive today I can build off of. I think people put too much emotion into it and not enough reasoning, and don’t think about the science behind it or the mentality behind it. They just get pumped up on the emotion and how they feel. 5PM: Greco is known for its physicality and like you have said, your mentality is to fight, fight, fight. How do you keep a good balance to where you’re, lack of a better term, a cerebral fighter? MM: I just don’t understand why people can’t marry the ideas of having techniques and being skilled and then just being a brawler. If you take my match, second-by-second, frame-by-frame, look at the kinds of ties I have. When I re-watch my matches I don’t just look at the whole picture, I look really closely at where my hands are, even where my feet positioning is. And that goes for all the styles. Where your hands, your head, and where your feet are, that’s what scores points. Those are the things that are important. You’ve got to look. Here’s something — the second period adjustments I made in the second match. Kamal kept breaking away from my two-on-one in the first period. I didn’t like that. I didn’t want him to keep breaking space because every time he does, he has the potential to keep high-diving me or ducking me right away. I wanted to limit him from breaking away to as few times as possible. So I started folding his wrist, which causes pain, and it locks out some of the other joints. When you have a two-one-one you pull it close to the body and fold your opponent’s wrist, and it locks up certain joints. And it’s a lot harder for them to yank it out and break it. I was really focusing on that. At the same time, I’m still pushing, I’m still fighting, I’m still getting my head banged up. But it’s those little things that…you can still have a hard match and fight. But if you’re just dumb and you go in to clash heads, you’re going to get thrown on your head more times than you’re going to score any points. 5PM: What is it about Penn State and this chapter in your life coming up if you were to take a step back and just look at it for a second? MM: I think it’s going to be the greatest jumping boards for growth in my life. I think Sem was a big growing point for my life and I think Penn State is going to be a big growing point as a human being, not just as a wrestler. Not just as a wrestler, but as a human being, as a scholar, as an athlete, and as a leader. I am going into the RTC program, so I am going to have a lot of responsibilities with that. And then I am going to be part of one of the greatest wrestling programs of all time. Hopefully, I am going to get into the Penn State Business School and have one of the best educations in the nation. I am deeply honored to be a part of it and be part of such a great community and environment where I can thrive and grow. If I do all of the right things and do my job, I think it will really turn my life out for the better, so I’m really excited for it. 5PM: This being your first Senior World Team, what are you looking forward to about this process leading up to the World Championships as far as training camps and things like that? 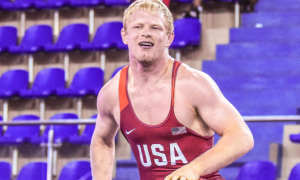 Mason Manville: I’m really just ready to throw my name in the ring on the international level. I want these people to know who Mason Manville is. I’m excited to throw my name in, that’s the main thing I am looking forward to. 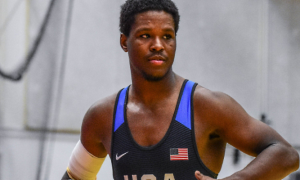 Yes, camps are going to be fun, I am going to enjoy being a part of a team, I am going to enjoy being a part of Team USA, but yeah, I’m ready to get to these next three tournaments under my belt and have some fun with it. Hopefully come back with some credentials and hardware, and at every step of the way look at the drawing board and make sure wherever I can upgrade and fix any problems. Just to get better at wrestling for the years to come. I don’t plan on this being the end of me. I don’t think this is going to be my magnum opus just quite yet. I’ve got plans to continue to do big things. I plan on competing as hard as I can and hopefully I come back with some credentials to my name.